John "Tony" Llewellyn was selected with NASA's second group of scientist-astronauts in 1967. He died on July 2, 2013. John Llewellyn, a chemist who in 1967 was selected to be a NASA astronaut but whose inability to pilot a jet led to him resigning from the space program a year later, died July 2. He was 80. A member of the United States' second group of scientist-astronauts, Llewellyn and his fellow candidates, including future shuttle veterans Joseph Allen and Story Musgrave, dubbed themselves the "Excess Eleven" as there were no missions for them to fly. Two members withdrew from the astronaut corps to return to their scientific studies due to the lack of spaceflight opportunities. For Llewelyn, who soon after his selection described his ambition as wanting to "make a successful flight, do some good experiments and get some good first-class science out of it," the choice to leave came well before a mission assignment was even an option. "My brother didn't have that instinct, but what he did have was a brilliant talent for chemistry and that's the reason NASA gave him a job in the first place," Roger Llewellyn, John Llewellyn's 67-year-old brother, told WalesOnline in an interview published on Sunday (July 14). 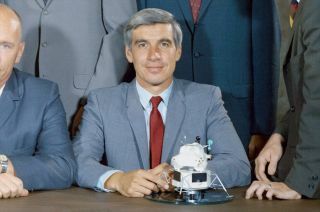 NASA announced John Llewellyn had resigned in a press release issued on Aug. 23, 1968. "Dr. Llewellyn said it became apparent several weeks ago that he was not progressing as he should," the statement read. "This week he withdrew after discussions with NASA and Air Force officials." Born in Cardiff, Wales in April 1933, John Anthony "Tony" Llewellyn was one of the first two naturalized U.S. citizens to be selected as a NASA astronaut. Attending school in the United Kingdom, he earned a bachelor of science and doctorate in chemistry from University College in Cardiff. Moving to Canada in 1958 as a post-doctoral fellow at the National Research Council in Ottawa, Llewellyn became a research associate at Florida State University, where he was later appointed an associate professor for engineering science and chemistry. Following his year training as a NASA astronaut, Llewellyn went on to become an aquanaut for the National Oceanic and Atmospheric Administration (NOAA), participating in the Manned Undersea Science and Technology program for five years beginning in 1971. "[He] lived in a dome on the ocean bed just off the south Florida coast in order to investigate just what happens to the human body at those kind of depths," Roger Llewellyn told WalesOnline. Returning to the Florida university system, Llewellyn was a professor of chemical and biomedical engineering at the University of South Florida. From 1997 until he retired 10 years later, Llewellyn served as the university's director of academic computing. In addition to his hobbies of scuba diving and spear and rod fishing, Llewellyn successfully made two trans-Atlantic sailboat crossings. In 1992, Llewellyn and a friend sailed from Gibraltar to Antigua, and then 8 years later, crossed the other direction from Miami to the Azores in 32-foot and 35-foot (9.7 and 10.7 meter) sailboats, respectively. Llewellyn is survived by his wife, their three children, and his two brothers. In lieu of flowers, the family has requested memorials be made to Metropolitan Ministries or Habitat for Humanities.